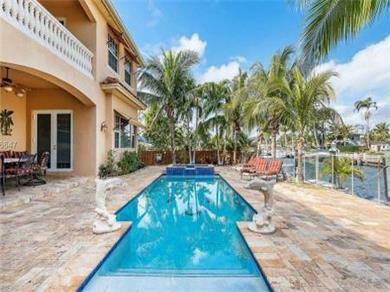 A beautiful Waterfront Villa boater's dream come true in guard gated community. Enjoy quiet Palm Tree lined 75' dock to accommodate a large yacht on deep water canal with no fixed bridges and direct access to the blue waters of the Atlantic Ocean. With very close proximity to 1st class shopping and dining at Bal Harbour shoppes. Immediate access to the bay, 5 minutes from beaches and the famous Bal Harbour Shops, 10 minutes from Design District, Wynwood and Aventura Mall. Whole Foods and Publix within 3 minutes. South Beach is 25 minutes. Fly into either Miami or Ft. Lauderdale, both airports are about 25 minutes away.